Biodiversity-the variety of genes, species, and ecosystems-is the basis for long-term ecosystem health and stability. Fifty percent of the world's biodiversity is inhabited in tropical forests. The world's biodiversity is diminishing and dwindling before our eyes at an alarming rate day by day. Half of the world's wetlands have been lost in the past century; 80 percent of grasslands are suffering from soil degradation; and 20 percent of drylands are in danger of becoming deserts. Every minute of the day, 28 hectares of forest are lost the world over. Wetlands and forests are being cleared for urban and industrial development and encroached upon by local people. Because of the irreversibility of species extinction and habitat loss, this rampant depletion of our biodiversity exerts a terrible toll on both the natural and economic world, affecting both current and future generations. It is the need of the hour to preserve and conserve biological diversity of all wetlands, forests and other ecosystems of the world. Seeing the importance of this, the United Nations designated the years 2011-2020 as the "United Nations Decade on Biodiversity." 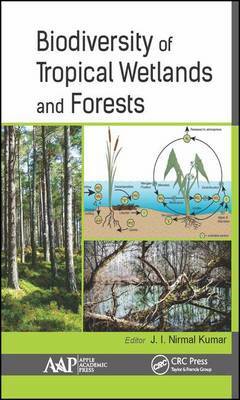 This volume, Biodiversity of Tropical Wetlands and Forests, is the compiled research of Dr. Nirmal Kumar and his team over the last couple of decades on a diverse array of impacts on the biodiversity of tropical wetlands and forests. Divided into two parts, the volume provides valuable information on spatial and temporal fluctuations of phytoplankton, zooplankton, macrophytes, birds, and seaweed biodiversity of important tropical wetlands, including pond, lakes, rivers, mangroves, and estuarine and coastal environments. It looks at their relationships and interactions with various hydro-geochemical nutrients along with limiting factors and quantification of anthropogenic pressures. The second part of this book presents an evaluation of plant and tree biodiversity in relation to soil nutrient content, concentration, nutrient dynamics, ethnobotanical, aesthetic values, resources use patterns, phenology of floral elements, biomass, net primary productivity, carbon storage and greenhouse gas emissions from tropical forests, wildlife sanctuaries, and plantations. Providing a plethora of valuable information, the book will be a rich resource for researchers and students in the forestry, life sciences, environmental science, and related areas.